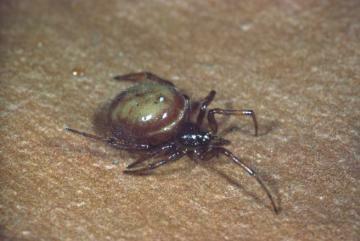 Steatoda bipunctata is widespread in houses, outhouses, garages, gardens and in other similar locations. The colour and pattern on its abdomen is variable, and as well as a whitish line around the front edge of the abdomen there may be an obvious whitish stripe down the middle. The females are usually confined to their web, in cracks in walls, under window sills, or within any suitable undisturbed spaces between surfaces and objects.